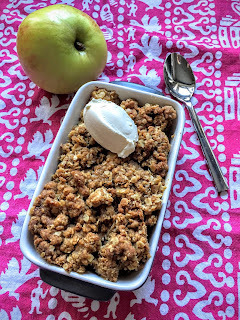 Most Apple Crumble recipes use a pale sugar like demerara or light brown but I had a bag of treacly soft dark brown sugar in the baking cupboard and I knew it would be perfect here, bringing toffee-like richness to the sharp apples. I also broadcast the recipe and cooking process live on Snapchat (where I'm BabaduckFood) and the response was fantastic. The recipe I learned in school uses just flour, butter and sugar for the crumble top but I really love the almost popcorn-like flavour that oats bring. You can also add sliced almonds, crushed hazelnuts or pecans, or a giant pinch of cinnamon to change the taste to your liking. Blitzing the crumble ingredients in the bowl of a food processor with the knife attachment is the fastest way to achieve the texture you want. By hand is perfectly fine, just make sure the butter is a little colder as the heat of your fingertips will soften it. Also, use your biggest dish that's at least 2 inches deep so you have a single layer of soft toffee-like baked apple and a layer of crisp crumble on top. If you use a smaller, deeper dish, the crumble is too thick and goes soggy in the middle. In a large bowl, mix together the apples, flour, lemon & sugar until it starts to ooze a brown syrup. Pour into the dish, level out and set to one side. In the bowl of a food processor, blitz the flour, oats, sugar & butter together until it looks like rubble. If you're doing this by hand, use a huge mixing bowl and be prepared for a bit of elbow work! 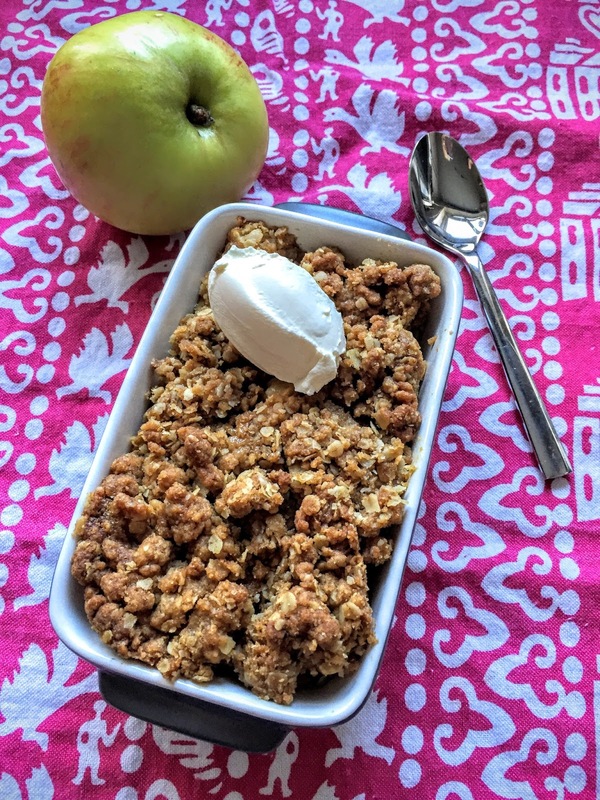 When the crumble mix is ready, sprinkle over the apple, spread it out evenly and bake for 40-45 minutes until the top is crisp and the apple juices are starting to bubble up. Remove from the oven and allow to cool for at least 15 minutes before serving as the apples will be molten hot. Spoon into a bowl and adorn with whatever you love, be it pouring cream, whipped cream, icecream, custard or creme fraiche. Eat with a big smile on your face.